I prefer FetchXml compared to QueryExpression or LINQ when writing custom code. Back during the CRM3/4 days there was Stunnware. 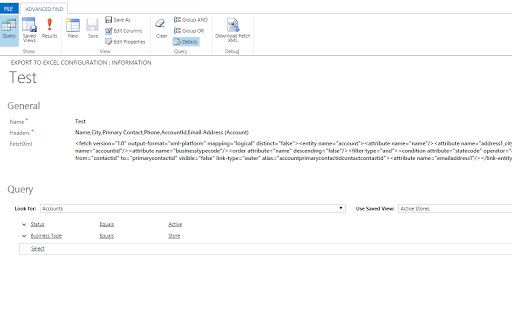 CRM2011 introduced capability to export the FetchXml directly from the Advanced Find. In CRM 2013/2015 you have four tools, to write and export the FetchXml. The fetchxml I build, is used mostly in a plugin or workflow assembly, but there are times when I want to store the fetchxml in custom entity, and use it a part of scheduled workflow logic. This also needs to be flexible, as I may need to change the fetchxml, without needing to rebuild any assemblies. The obvious and most straight forward way to do this would be to have a textarea field in the form, and copy-paste the fetchxml that was generated from one of this tools, or from the advanced find. What if there is an better, albeit unsupported way? You can embed the advanced find on the entity form that needs to store the fetchxml, and get the fetchxml from the advanced find, when the user saves the record. The trick is to call ShowQuery straight after ExecuteQuery, so that div with id FetchXml contains the correct value. If we don’t call the ExecuteQuery, the value of FetchXml won’t be updated when the advanced find is modified by the user. Once again, this technique is unsupported, so use it at your own risk. I have tested this in Firefox 34 and CRM 2013 6.1.0.581. UPDATE (24/12/14): There was an issue with the initial script, as it was only working if the organisation was a default one. The initial script split the screen horizontally, if the IFrame url was correctly set using getClientUrl. The updated script fixes this issue. Based on my testing, this is working in Firefox 34, Chrome 39.0.2171.95 and IE 11(in IE9 mode only). One more thing to note -> If the tab with the Advanced Find IFrame doesn’t started out collapsed, the Ribbon Interface of the Advanced Find shows up on the form.